LOS ANGELES: Nasa’s first spacecraft built to explore the deep interior of another world streaked towards a landing scheduled for Monday on a vast, barren plain on Mars, carrying instruments to detect planetary heat and seismic rumblings never measured anywhere but Earth. After sailing 548 million km on a six-month voyage through deep space, the robotic lander Insight was due to touch down on the dusty, rock-strewn surface of the Red Planet at about 3pm. EST (2000 GMT). If all goes according to plan, Insight will hurtle through the top of the thin Martian atmosphere at 19,310 km/h. Slowed by friction, deployment of a giant parachute and retro rockets, Insight will descend 123 km through pink Martian skies to the surface in 6 1/2 minutes, travelling a mere 8km/h by the time it lands. The stationary probe, launched in May from California, will then pause for 16 minutes for the dust to settle, literally, around its landing site, before disc-shaped solar panels are unfurled like wings to provide power to the spacecraft. The mission control team at Nasa’s Jet Propulsion Laboratory (JPL) near Los Angeles hopes to receive real-time confirmation of the craft’s arrival from data relayed by a pair of miniature satellites that were launched along with Insight and will be flying past Mars. The JPL controllers also expect to receive a photograph of the probe’s new surroundings on the flat, smooth Martian plain close to the planet’s equator called the Elysium Planitia. The site is roughly 600km from the 2012 landing spot of the car-sized Mars rover Curiosity, the last spacecraft sent to the Red Planet by Nasa. 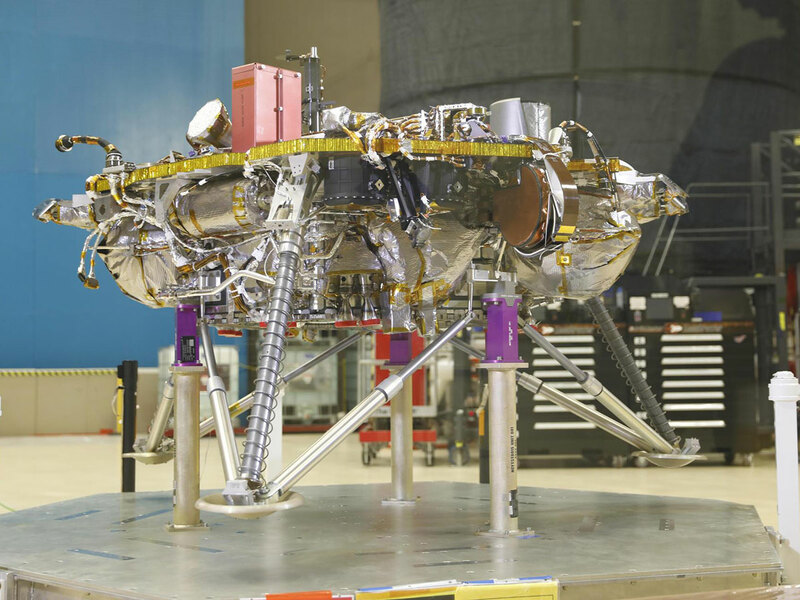 The smaller, 360kg Insight — its name is short for Interior Exploration Using Seismic Investigations, Geodesy and Heat Transport — marks the 21st US-launched Mars missions, dating back to the Mariner fly-bys of the 1960s. Nearly two dozen other Mars missions have been sent from other nations. Insight will spend 24 months — about one Martian year — using seismic monitoring and underground temperature readings to unlock mysteries about how Mars formed and, by extension, the origins of the Earth and other rocky planets of the inner solar system. While Earth’s tectonics and other forces have erased most evidence of its early history, much of Mars — about one-third the size of Earth — is believed to have remained largely static, creating a geological time machine for scientists. Insight also is fitted with a German-made drill to burrow as much as 5 metres underground, pulling behind it a rope-like thermal probe to measure heat flowing from inside the planet.